I was about to write an entry since yesterday as while I was waiting for the Subuh prayer in the morning, I watched about the Muslim community in Albania, which was once a communist country. In 1964-1967, as the communist rules, religious groups and any related activities with religion is being prohibited. The muslims there had to pray and preach in silent. Mosques were turned into something like social clubs or something, how sad. The Islamic awareness has raised back in 1994, since the fallen of the communist empire. The islamic community was being fully supported by the businessmen all over Albania. They sent their potential scholars to study in the Middle East and coming back managing their Islamic madrasah (spelt madraseja) to be ran as any other ordinary schools providing all sort of religious to modern education to the students. They don't have to wear any uniform and yet they can perform well in their studies and yet become a very good muslim. They started their classes by reciting al-quran first before getting into the conventional classes. I envy them for being able to emphasize Islam as a way of life rather than just being a muslim for the sake of inheriting it from the ancestors. They have never called themselves a Muslim country, and being a Muslim means being a minority in their own country. Sorry lah.. We're not there yet.. as I've been to the accessory shop for the 2 days (yesterday and today), most Malays who come to the sho didn't fast. They smoke as they like, bought drinks from the neighbouring mamak shop like nobody's business and eat in front of me like it's just a normal day. It's more humiliating actually to see a malay woman who is not fasting, not only eating but also freely smoking in the shop. 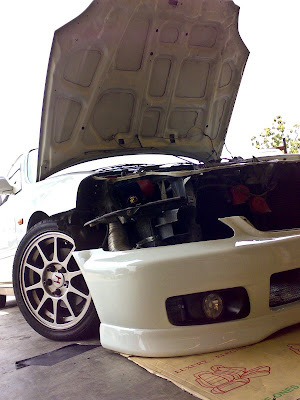 And today, previously, I went to the same shop to do some minor headlight and foglight repair, an aged malay who was not fasting, asked the wife or the girlfriend to buy him a pack of dunhill cigarette and a can of drink from the mamak shop next to it. And I felt more humiliated when the shop's staff asked me to have my lunch. They said, nowadays it's okay not to fast, not like before.